Patrick Akpan, a Mechanical Engineering student, doing his PhD at UCT, won the first-ever African Youth Energy Innovator Award at yesterday's Africa Energy Indaba Exhibition at the Sandton Convention Centre in Johannesburg. Patrick's energy efficient fruit palm sterilizer won the award for the best African energy innovation. Palm oil is used in beverages, cosmetic products, cooking and baking. "For me, it's like waking up from a dream. This idea was conceived some years back, and I did some work on it, but since I was not getting support on it, I left it on the shelf. Now, I can see a brighter horizon, and I've met a couple of people at the exhibition who said they would like to work with me to see what can be done on it, and so I see the product going to the market shortly," said Akpan. The Africa Energy Indaba has created a much-needed platform for youth talent in Africa to showcase their important work. The other innovators who were chosen included Jonathan Naude from the University of Stellenbosh with his solar tracking mechanism, Paseka Litabe from Pretoria and his photovoltaic blinds, Mpumzi Swana from KZN and his desalination using Hydro energy and Mbangiso Mabaso from the Free State with his EED CITY energy saving game app. 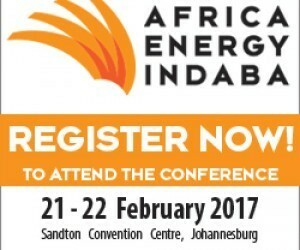 "Africa Energy Indaba was pleased with the success of the first Africa Youth Energy Innovator Showcase this year. Africa needs to invest in and grow its next generations of energy leaders if its countries and the broader continent are to compete in the global arena. Africa Energy Indaba is committed to empowering talented young Africans by allowing them to be seen by the industry experts and energy decision makers," said Subramony. The top 5 innovators, who hail from across the continent, pitched their products to a panel of judges and after a tough Q&A session, the winner of the evening emerged. "In Africa, and especially in South Africa, we come from an avenue where not everybody had the same background, and if you have to bunch young people together with the big projects, they are going to get drowned, so these platforms allow us to focus in and consider young people in the context where they actually grew up and come from. This award is to promote young people in their particular context," said Keith Cassie from the Standard Bank Incubator Programme. The Innovators showcase was highlighted as a success based on a large number of visitors to the event and the support from media partners such as Mail & Guardian. The event sponsors were Standard Bank, Exxaro and the Africa Energy Indaba. Each innovator has been awarded a spot in the prestigious Standard Bank Business Incubator Programme. "This Youth Energy Innovator Showcase has been a labour of love, undertaken to bring much-needed visibility to the talented youth Africa has to offer," concluded Subramony.